A significant fraction of the functional variation in humans lies outside of known protein-coding regions. We all know that. Yet every individual’s genome harbors millions of noncoding variants, most of which are likely neutral with respect to phenotypes. Identifying the subset of noncoding variants that are functional remains notoriously difficult, and represents a considerable scientific challenge we face as we enter the whole-genome sequencing era. Intronic variants can influence splicing (e.g. exon skipping, hidden exons, etc). Regulation of gene expression is another mechanism by which noncoding variants can play a functional role in cells without altering protein sequence. Aberrant gene expression has also been linked to many diseases. In cancer, for example, over-expression of oncogenes often drives tumor development, growth, and metastasis. In the other direction, many autosomal dominant Mendelian disorders are caused by haploinsufficiency (i.e. loss of one copy of a gene by deletion or mutation causes disease). 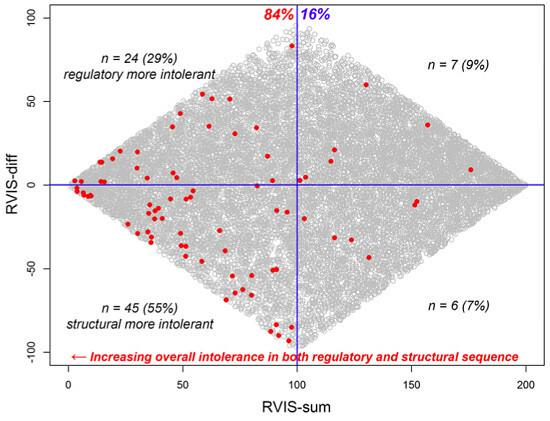 The noncoding residual variation intolerance score (ncRVIS) is calculated by comparing the observed levels of “standing” variation to the expected levels using whole-genome sequencing data from 690 individuals. The protein-coding RVIS score is calculated in the same way, but using the gene’s coding sequence. The noncoding GERP score (ncGERP) reflects the extent of phylogenetic conservation, computed as the average GERP++ score across the regulatory sequence. The noncoding CADD (ncCADD) and noncoding GWAVA (ncGWAVA) scores are computed in a similar way: as the average score from these two frameworks for prioritizing noncoding variants. ClinGen dosage-sensitive genes, which are curated by experts as either haploinsufficient or triplosensitive. Dosage insensitive genes, which are inferred based on overlap with common CNVs in a public database. Here, the area under the curve (abbreviated AUC) is a metric for the performance of a certain score at predicting disease genes. The right-most column (HI) is the haploinsufficient gene set. 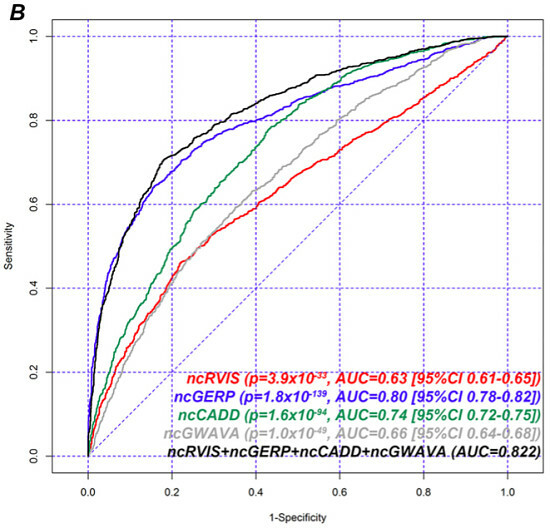 We can see that the protein-coding RVIS score does extremely well, with AUC=0.712 and a very significant p-value. This makes intuitive sense, because genes in which de novo mutations cause dominant disease should exhibit strong signals of purifying selection. It’s encouraging to see that ncRVIS and ncGERP scores also correlate with haploinsufficient genes: it not only supports these methods for assessing noncoding variation, but reinforces the notion that proximal regulatory regions are also under purifying selection for the same reason (i.e. variants within them could cause pathogenic changes to gene expression). The most important takeaway from the figure is this: 84% of haploinsufficient genes are in the 50th percentile or better for overall RVIS. Among those 69 genes, about two thirds (45) showed greater intolerance in coding sequence than in regulatory sequence. Yet the remaining third had greater intolerance in regulatory sequences than in coding sequence, which is very surprising. It suggests that, for an appreciable portion of haploinsufficient disease genes, noncoding variation is under stronger relative (compared to other genes) purifying selection than coding variation. 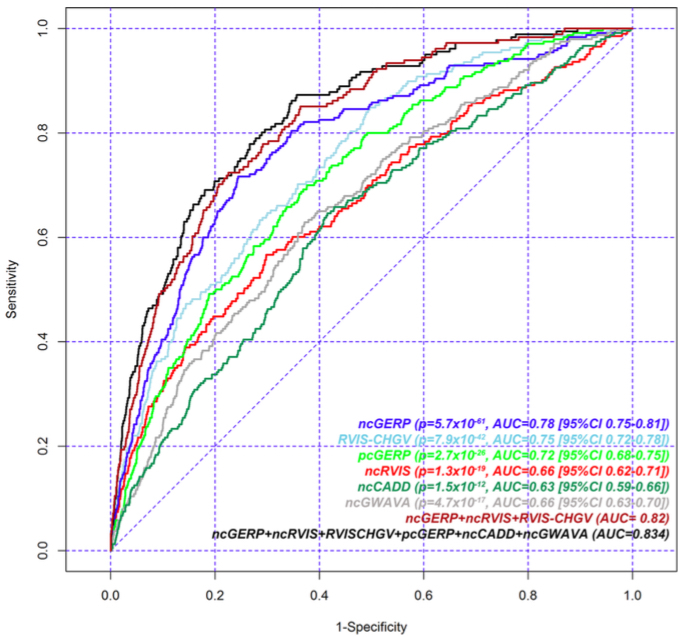 Again using AUC as a metric for overall performance, we can see that ncGERP outperforms all other single methods of gene scoring, followed by coding-RVIS and coding-GERP scores. The noncoding score methods (ncRVIS, ncCADD, ncGWAVA) had similar performance. Yet the joint models achieved the best overall performance, suggesting that each of these approaches brings something to the table. 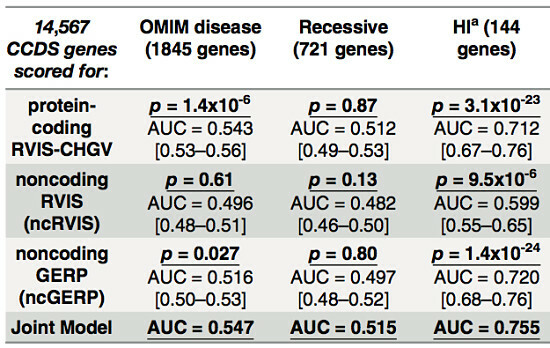 The overall AUC values here seem higher than for the hapolinsufficiency evaluation, suggesting that most of these methods do better at predicting ClinGen dosage-sensitive genes than OMIM haploinsufficiency genes. Next, the authors performed a similar evaluation, but on the list of genes significantly depleted for loss-of-function variants, based on their evaluation of 6500 exomes from ESP. Here, the noncoding RVIS score was significantly correlated with LOF-depleted genes, but nevertheless outperformed by the other approaches (GERP, CADD, and GWAVA). Kudos to the authors for owning up to the fact that other scoring approaches consistently outperform theirs. In fairness, however, algorithms such as CADD and GWAVA incorporate a huge amount of information (evolutionary conservation, ENCODE annotations, GC content, etc. ), whereas the RVIS framework only incorporates variation data from WGS of a modestly-sized cohort. Importantly, CADD, GERP, and GWAVA rely heavily on phylogenetic conservation to compute their scores. This makes them powerful discriminators of functionally relevant sequences maintained across evolution. However, it also makes them relatively blind to human-specific regulatory sequences, which likely have an important role to play in common complex diseases. I encourage you to read the full article over at PLoS Genetics. Don’t forget the supplement: Data file 1 contains the RVIS calculations for all CCDS genes, and that alone makes this study an important resource to the research community.